Copy right reserved by Northstar Polymers 2000 - 2018. Northstar Polymer prohibits duplication of the contents of this web site for the purposes of public display and/or using on another web site without a written authorization by Northstar Polymers. Ester base high-performance polyurethanes are known for high tensile strength, excellent abrasion resistance as well as cut/tear resistance. Parts molded with these types of materials are used in a variety of applications including liners in material handling, grain elevator buckets, pulleys, sprockets, and other mechanically demanding applications. These are also known for excellent oil resistance; however, for long-term use in constant aqueous environments, we recommend considering one of our polyether systems listed under this. These are systems consist of a MDI/Ester prepolymer at higher %NCO (15 - 26 %) cured with our special curatives. "Quasi" systems are known for low viscosity and relatively lower processing temperature. These are conventional prepolymer systems consists of MDI/Ester prepolymers at lower %NCO (less than 15 %), can be cured with 1,4-Butanediol, other standard amine/polyol urethane curatives, or our special curing agents. These are commonly called "hot-cast" urethane systems. PTMEG polyether base high-performance polyurethanes are known for "high-energy" characteristics, which include high-rebound, excellent abrasion resistance, and high elongation. Together with their excellent tensile and cut/tear resistance, parts molded with these materials are preferred in a variety of applications including inline skate wheels, sizing screens for mined products such as rocks/sand/minerals, material handling parts, and other highly demanding applications. These are also known for excellent water resistance and are recommended for long-term use in constant aqueous environments. These are conventional prepolymer systems consists of MDI/Ester prepolymers at lower %NCO (less than 15 %), can be cured with 1,4-Butanediol, other standard amine/polyol urethane curatives, or our special curing agents. These are also commonly called "hot-cast" urethane systems. NOTE: The gray shaded products are our new improved formulas intended for mold-making materials for precast concrete applications. - Other specialty applications such as re-enterable electronic component potting applications and vibration dampening parts to protect sensitive electronics. * variable hardness in a Shore OO Range. MCP-V40A is polyether base polyurethane gel elastomer. This material is specially designed to yield elastomeric parts with very low rebound property. The possible applications include vibration dampening/ impact dampening parts for various machinery and ergonomics products. "Polyester base, oil resistant gel"
"Thin casting gel for tack-pads applications"
GK-7 is formulated for manufacturing a thin layer of polyurethane gel film by casting or laminating method. The component material has lower viscosity to allow a good flow of the material for production of gel film or thin gel sheets may be used in tack pad parts for cell-phone holder and tablet holders. "Sticker gel for tack-pads with higher adhesion property"
GK-22 is formulated for manufacturing tack pads and other pressure-sensitive-adhesive products that require a higher adhesion property to hold heavier items or to provide enough adhesion in a small area. Low Tack, stand-along moldable gel. NTG-9 has much less surface tack than the other polyurethane gel type material. Low viscosity components, fast cure, and low tack surface allows this material to be used in similar ways that TPE polymers are used. "Standard OOO scale soft gel"
MPP-W43D is formulated for applications which require OOO Durometer hardness self-standing parts, where MPP-V37A cannot achieve without loosing integrity as a self-standing part without encapsulation. "Low viscosity, bio-base OOO scale gel"
MPC-W44A is formulated for applications which require OOO Durometer hardness similar to MPP-W43C, but achieving the goal by use of low viscosity components. This material contains bio-base renewable materials, which can be above 40% of the total weight. 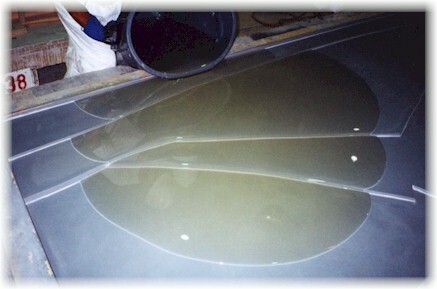 MCG-1 is a very unique combination of polyurethane gel and microcellular foam. The cured material contains small amount of foam within. It has very soft surface and very gradual compression deflection characteristic. TFG-5 is specifically developed for "filler" applications such as low-speed tire filling application and re-enterable potting/filling applications. The same combination of part-A/part-B components can make solids of various hardness by simply changing the mixing ratio. "Lower viscosity OOO Scale Gel"
SAI-1 is formulated to yield Shore Durometer OO range elastomer gel material from low viscosity components at room temperature. Possible applications with this material include inner coating for puncture-free tires and encapsulation of electric components and cables. Polyurethane Foams are used in a wide variety of applications. Open-cell flexible foams are widely used in seat cushion applications. Closed-cell rigid foams are used in insulation applications. Closed-cell rigid structural foams are used to support variety of structures and used for many molded products. Microcellular flexible foams are used in more heavy duty cushioning applications such as railroad noise dampening pads. Rigid Structural Foams are widely used in insulation, product core, molded consumer products, and many other applications. It’s load bearing strength at higher density can be utilized in potting application for to protect equipments and structures. Easy room-temperature-mixing and forgiving ratio variation allow this class of materials to be used in cast-in-place applications of various ranges. Generally, higher density foam has higher mechanical strength. Closed cell rigid foam with 3.5 - 4.0 lbs/cuft can be used in cast-in-place applications for mold-backing, filling, and insulation applications. Mixing Ratio: 1:1 by volume. Natural color: Dark yellow to amber color. Closed cell rigid foam with 6.6 lbs/cuft common in cast-in-place applications. Also used as potting compound for load bearing electronic parts. Higher density provides improved load bearing properties over MPP-R03A. Mixing Ratio: 1:1 by volume. Natural color: Dark yellow to amber color. Closed cell rigid foam with 20 lbs/cuft common in cast-in-place applications. This foam is designed to be a bonding agent tp compound a load bearing material. Flexural strength 1090 psi, compressive strength 950 psi. Mixing Ratio: 1:1 by volume. Natural color: Dark yellow to amber color. Microcellular foams are high density closed cell foams. Some of our microcellular foam materials are made with high-performance class materials. The microcellular foams can be formulated to have very high mechanical properties. Flexible open-cell foams are widely used in cushioning applications, such as seating, padding, toys, and other custom applications. This foam formulation is designed to make cushioning products in molds. The components are liquid at room temperature. For a small quantity, this can be batched manually by hand tools. This foam formulation is designed to make very soft viscoelastic foam parts in molds for specialty foam products. Notice: All of the statements, recommendations, suggestions, and data concerning the subject material are based on our laboratory results, and although we believe the same to be reliable, we expressly do not represent, warrant, or guarantee the accuracy, completeness, or reliability of same, or the material or the results to be obtained from the use thereof, neither do we warrant that any such use, either alone or in combination with other materials, shall be free of the rightful claim of any third party by way of INFRINGEMENT or the like, and NORTHSTAR POLYMERS DISCLAIMS ALL WARRANTIES, EXPRESS OR IMPLIED, OF MERCHANTABILITY and FITNESS FOR A PARTICULAR PURPOSE. Semi-rigid foams are rigid, but with some give to resist impact forces. Semi-rigid foams can also be used as structural foam. Open cell structural/ semi-rigid rigid foam with 2.3lbs/ft3. This light weight impact resistance structural foam can be used in bumper parts, molded foam products, cast-in place gap filler, and many other custom applications. Due to the foam flexibility, a significantly smaller amount of saw dusts is produced when the foam is machined. Mixing Ratio: 1:1 by volume. Natural color: Cream Color to Dark yellow. Mostly closed cell semi-rigid foam with 9.0 lbs/cuft. This material is designed to serve applications which require the part structure to have some load-bearing capacity. Most notably, the material has a long pot-life (5 min.) for this class, which allows an easier hand mixing/pouring operation and making larger parts.